Five years after his passing, Ronnie James Dio’s presence in the world of heavy metal is still felt and heard via the endless live albums and tribute releases that arrive every year. While I think the releases of live material needs to be given a rest for a bit, I’m still interested in the tribute releases. It’s hard to fault anyone who wants to pay their respects to metal’s greatest vocalist. 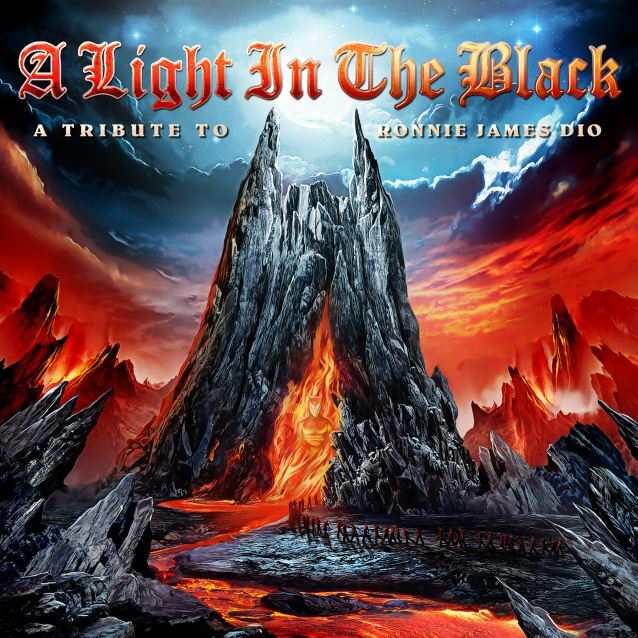 By my count, this is the fourth notable Dio tribute album with the previous ones being Jorn’s Dio, last year’s Ronnie James Dio – This Is Your Life and Joey DeMaio’s Magic: A Tribute to Ronnie James Dio (which does not have Wendy Dio’s blessing). Jorn’s tribute is my favorite of all the Dio tribute albums. This Is Your Life was pretty good (but had some bad moments), but I think A Light in the Black is a much more solid release than what was put together last year. This Is Your Life relied on star-power, and it was a great idea, but this is cool in that it’s a bunch of more obscure metal bands (all signed to Massacre Records) not straying too far from the script. I won’t list every band here but a few such as Crystal Ball, The Order, Circle of Silence, MessengeR, Gloryful and Rebellion make more than once appearance. I have no clue what any of these bands sound like when they play their own original tunes but they did a good job covering Dio’s career and it makes me want to check out their discography and see what their own stuff sounds like. Well, except for Burden of Grief’s version of “Neon Knights”. Wow. That’s metal-core/death metal terrible. Couldn’t even finish that one. The music was fine, but those vocals… Arrrgh. Nor do I like Rebellion’s take on “I” which is more of the same, vocally. Shame since that’s one of my favorite Black Sabbath songs, ever. Though do a better job with their cover of “Kill the King”, though. Yes, there’s TWO versions of “Kill the King” here; MessengeR takes a crack at the song on the first disc. This album covers all of Ronnie’s metal career (although it’d be nice if someone through in a metal version of his doo-wop days sometime): Rainbow, Sabbath and Dio. What’s interesting is the inclusion of David Feinstein’s “Metal Will Never Die” (covered by Gloryful), a sung which Ronnie guest spotted on for Feinstein’s Bitten By the Beast album, which I believe was the last song Ronnie ever recorded. You don’t have to know any of these bands featured to enjoy this album. If you love the music of Ronnie James Dio and are interested in hearing how other vocalists do when tackling some of his classics, A Light in the Black is definitely worth a listen.